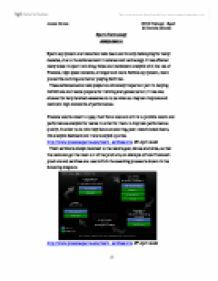 Sports Technology Assignment 2 Sports equipment and materials have been continually developing for many decades, due to the advancement in science and technology. It has effected many areas in sport including, video and movement analysis with the use of Prozone, high speed cameras, stronger and more flexible equipment, more protective clothing and better playing facilities. These advancements have played an extremely important part in helping individuals and teams prepare for training and games better; it has also allowed for very detailed assessments to be taken so they can improve and maintain high standards of performance. Prozone was founded in 1999; their focus was and still is to provide match and performance analysis for teams in order for them to improve performance quality. In order to do this they focus on scouting, post-match break down, live analysis feedback and trend analysis queries. http://www.prozonesports.com/main_services.htm 8th April 2008 Their service is always matched to the team's goal, values and aims, so that the team can get the most out of the products, an example of how Prozone's products and services are used within the coaching process is shown in the following diagram: http://www.prozonesports.com/main_services.htm 8th April 2008 The development of computers and their software has allowed for companies like Prozone to enlarge the services and products they offer. Back in 1992, when the English Premier League was formed, technology such as Prozone's was not around and analysis of a game was usually through observation from the coaching staff and notes made throughout the game. Prozone has proved extremely useful and is recognised by managers in football and rugby as an imperative part to their coaching process; testimonials have been given about Prozone and include those from Sam Alladyce and Jake White of South Africa's rugby team: http://www.prozonesports.com/aboutus_Testimonial.htm 8th April 2008 Prozone offer 6 products for teams to use, these include: * Prozone 3 - This provides physical data on player movements and statistics on tactical elements of the game. ...read more. As Hawkeye reacts almost instantly the time taken for a decision to be made is irrelevant and the game will not be interrupted as many people tend to think. This technology will remove any retributions from the game and save time from player's arguing their case, in scenarios like these: http://iamadonut.blogspot.com/pics/050105-nickedfromthesun.jpg 10th April 2008 http://news.bbc.co.uk/olmedia/50000/images/_53595_shearer_goal.jpg 10th April 2008 Equipment and clothing has also advanced as the years have gone by. Football boots are constantly being modified to make them more appealing to player's today, the same with the materials used for playing and training kits. Football Boots Football boots used to be made entirely out of leather, even the studs! These would become extremely wet and heavy making it difficult for the players to run fast and control the ball. These remained unchanged however, until after the second world war, where producers of boots started to emerge. We live in a world now where everyone wants the next best thing, it has to be better, more advanced and more original than any other product in the market. Football boots have become very much the same. Since 2000 many styles of boots have been created which approach the game at a slightly different angle. For example in 2002, Nomis Wet technology created the sticky boot: http://www.footy-boots.com/wp-content/uploads/2007/05/pig.jpg 10th April 2008 http://www.footy-boots.com/most-innovative-football-boot/ 10th April 2008 We have recently seen a rise in the number of injuries caused due to the lack of protection from the football boots, e.g. Broken metatarsals. With companies aiming to get boots as light as possible layers of material which would usually protect the foot are left off, this can result in numerous injuries in the slightest of tackles. Whilst the use of advanced systems and technologies has helped increase performance the risk of injury has also been increasing which could do more damage to the players than good. At the moment it is up to the player what types of boot they use, but if injuries become more frequent as a result of unprotected boots then it may be necessary for the FA to apply certain requirements. ...read more. This method of testing is not valid in terms of accurate body fat percentage but can be used to identify any changes to the body over a period of time. As each person will measure a skin fold slightly differently results will vary which means they are not always reliable. http://www.topendsports.com/testing/tests/skinfolds.htm 17th April 2008 'Archimedes' principle, principle that states that a body immersed in a fluid is buoyed up by a force equal to the weight of the displaced fluid.' http://www.infoplease.com/ce6/sci/A0804583.html 17th April 2008 It is now possible to use underwater weighing to determine an individual's body composition and is based on Archimedes principle which is quoted above. It works due to bone and muscle being denser than water; therefore if a person with little fat was placed underwater they would weigh more and have a lower percentage body fat compared to an individual who contained a large amount of fat mass. Someone with a bigger fat mass would weight lighter in the water and therefore have a higher body fat percentage. If the director of the test follows the correct guidelines for hydrostatic weighing and the athlete exhales all their air before entering the water then there will only be a � 1.5% error. The main advantage of the hydrostatic weighing machine is that its extremely valid and reliable as test-retest results have proved consistent. It is also a relatively cheap test to get done varying from anything between �5 and �30. However, at the moment there are several disadvantages including: * The test requires a lot of equipment and a lot of space * It takes a long time to prepare and perform the test * A highly experienced director is needed to carry out the test and calculate the results * It is not the most comfortable of tests as some people can become anxious and claustrophobic about being submerged in water. At the moment hydrostatic weighing machines are usually found at Sporting universities/colleges and research centres, making them quite easy to get to. 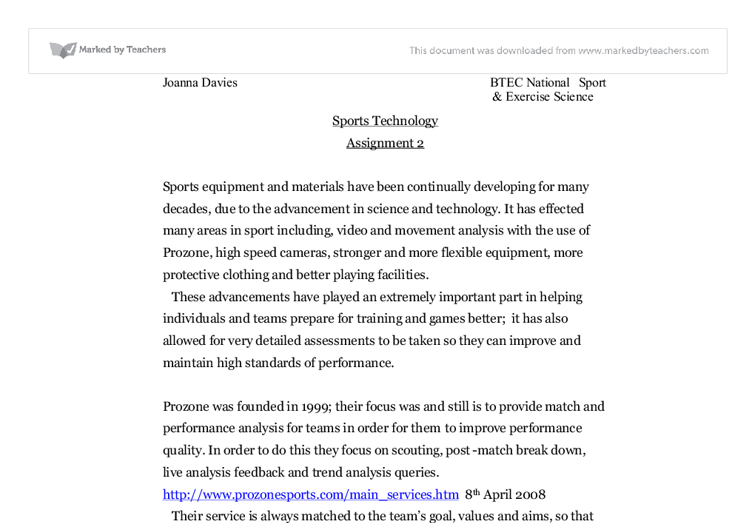 http://www2.gsu.edu/~wwwfit/bodycomp.html 17th April 2008 Joanna Davies BTEC National Sport & Exercise Science -1 ...read more. I need to correct this because if I am standing further back from my defensive line I will have a much higher chance of being able to move into position and make the tackle and prevent the opposing team from scoring a try. He would run into the bags and then break the contact; he would then offload to a player running on his left or right shoulder. This would be imitating a situation when a player breaks the tackle, gets over the gain line and then brings another player into the attack. Which is often the reason that we give for the results we achieve. E.g. a team member may cite bad weather as a reason for the team losing. Attributions are important because of the ways they affect motivation, affects future performance, future effort and continued participation or not. which I can improve on it is via getting a new coach, this is because they lack to training me in gaming situations therefore when it comes to an actual game, I struggle to transfer the shot in which I pick up in training, and usually lacks any consistency and any conviction. Children don't have very long attention spans and get bored very quickly so it is important to keep the sessions different and as interesting as possible. Giving goals and targets for the group to reach will make younger children want to take part. The advantage of the instep is that it presents a flat surface to the ball, and can also be used to make the ball swerve and dip. The non-kicking foot provides support while kicking, and should be bent as you kick.